It takes team energy to bring it all together. I'd like to throw out a sincere thank you to my sponsors for their support. I've got some of the best sponsors in the ski industry supporting the team and I urge fans to visit sponsor sites and ride their gear in some cases it's developed and tested with the help and input of JJ. 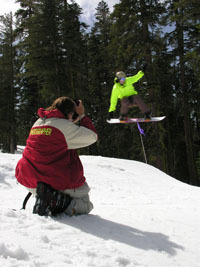 Ski and snowboarding equipment Rental & Leasing in Kirkwood, CA.